Set up a stunning display of creativity and soft light by arranging several of these unique lanterns as part of your Christmas tableau. The Crescent Moon Fairy Light Lantern is a unique orb filled with LED string lights that dangles from a moon-shaped black metal stand covered with heavy twine. The sphere is available in the shape of a glass globe or glass apple and measures 4.5” x 4.5”. 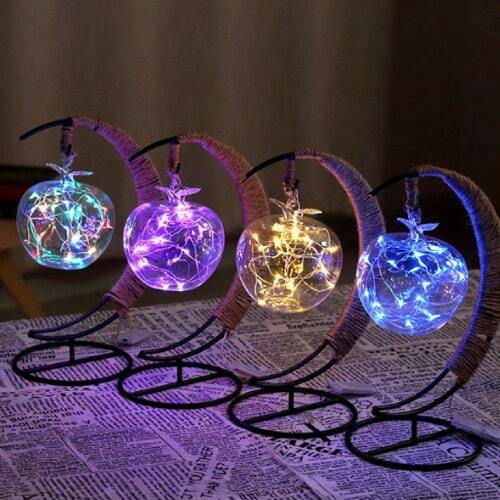 The fairy lights come in a variety of colors that include multi-color, yellow, blue or purple. The crescent moon stands 10” high. Get one of each to create a striking display as a set or put one in every room of the house as part of your Christmas decorations! While the handcrafted fairy light lantern can really add to your holiday décor, it also makes a wonderful Christmas gift for all ages. This can be the perfect item for that person who is so difficult to buy for!